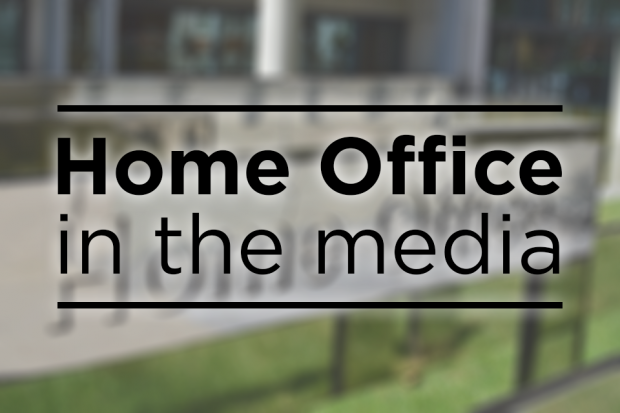 Today’s Home Office in the media stories include the Home Secretary’s appearance in front of the Home Affairs Select Committee and a number of reports on medicinal cannabis. There is widespread coverage of the Home Secretary’s comments to the Home Affairs Select Committee (HASC) yesterday about a future immigration system post-Brexit. Sajid Javid told MPs yesterday that there would be a “complete, total end to freedom of movement” after Brexit. The Financial Times and the Sun report that the Home Secretary has defended the principle of denying EU citizens preferential rights to live and work in the UK after Brexit. During the HASC evidence session, the Home Secretary also said that a report into the conduct of civil servants over the advice they gave the then Home Secretary Amber Rudd during the Windrush scandal could be released. The Guardian produced online copy yesterday following his comments. The Home Secretary’s comments can be found on Hansard. The Times and Mirror report that Hannah Deacon, mother of six-year-old Alfie Dingley, who suffers from a severe form of epilepsy, has legally brought medicinal cannabis oil into the UK for the first time. She arrived at, and was allowed to pass through, London City Airport yesterday evening with a five-month supply of tetrahydrocannabinol from Amsterdam after licences were granted by the Home Office for her son on June 19th. The Times mentions that an assessment is being carried out by the ACMD following the Chief Medical Officer’s advice that there was conclusive evidence of its benefits for some conditions. It also reports on the fact that Charlotte Caldwell is now fighting for her son Billy to be given his medication at home, rather than hospital, after the Department of Health in Northern Ireland issued an emergency license for his treatment. The Today programme also reported that Sophia Gibson from Northern Ireland, who suffers from a severe form of epilepsy and is waiting for her own cannabis oil license, was rushed to hospital and placed on life support yesterday. We completely sympathise with the families who have been facing desperate situations as they try to find treatment. That is why the Government has taken action, creating an expert panel to review individual medicinal cannabis licence applications. The Home Office does not comment on individual applications submitted to the expert panel of clinicians.